Saudi authorities say they have gathered troops along the border with Yemen in preparation for any possible ground offensive, Reuters reported on Tuesday, adding that no exact time to send the troops in has yet been stipulated. Pakistan, which has previously supported Riyadh by deploying troops to Saudi Arabia to provide extra regional security, also said that it is sending troops to support Saudi Arabia in the context of the current Yemeni conflict, the agency reported. Despite airstrikes delivered by Saudi air forces and their Gulf allies, the Houthis are continuing their offensive against the dwindling loyalists of President Abd Rabbuh Mansur Hadi. Hadi was ousted by the rebels and fled to Saudi Arabia, requesting military intervention from the Arab states. The heaviest exchange of cross-border fire since the start of air offensive was reported on Tuesday, with Saudi troops clashing with Yemeni Houthi fighters. Hadi-allied officials have remained hopeful that Riyadh would send ground troops to turn the tide for the ousted official. “We are asking for that [Saudi ground operation in Yemen], and as soon as possible, in order to save our infrastructure and save Yemenis under siege in many cities,” the president’s Foreign Minister Riyadh Yasseen said an interview with al-Arabiya Hadath TV channel. “This war is not about Yemen or the Houthis, it's about what used to be a cold war between the Persians and the rest of the Islamic world, especially the Arab Gulf. Today the cold war became a real one,” political analyst Roula Taj told RT. More casualties have been reported in the escalating conflict, with overnight street clashes in Hadi’s stronghold Aden claiming at least 26 lives, Reuters reported, citing a health ministry official. Ten others died during the Tuesday shelling of a residential building close to the residence once used by the president, the agency reported referring to witnesses accounts. In the central town of Yarim, an air strike hit a fuel tanker, killing at least 10 people, residents said. Coalition bombers targeted rebel positions near the airport of the Yemeni capital of Sanaa, while fighters from the Houthi militia entered a coastal military base overlooking the Red Sea's strategic Bab el-Mandeb strait on Tuesday, local officials told Reuters. Heavy fighting between Hadi loyalists and opponents was also reported in southern province of Dhalea. On Monday, 45 people were killed and another 65 injured in an airstrike by a Saudi-led coalition at a refugee camp in Houthi-controlled northern Yemen, according to the International Organization for Migration (IMO). The airstrikes have also affected the Red Cross medical supplies deliveries to the area, with the planes which are carrying the necessities unable to fly to Yemen. “In Yemen today we have a very serious humanitarian situation. Hospitals are running at a low capacity... We need to bring in urgent medical supplies to sustain our stocks,” spokesperson at the International Committee of the Red Cross (ICRC) for Near and Middle East Sitara Jabeen told RT. So far, the airstrikes have failed to change the military balance in Yemen. 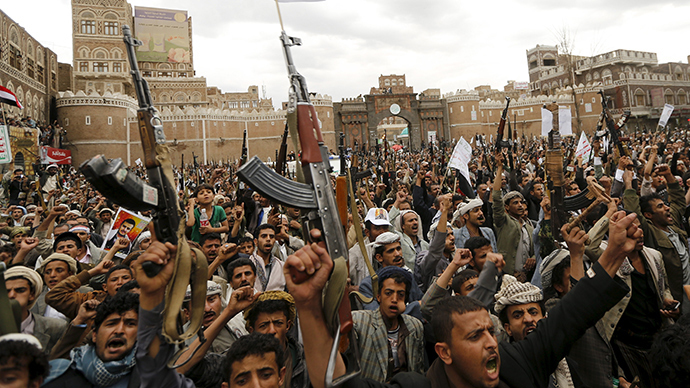 While Houthis reportedly found an ally in Yemen's former President Ali Abdullah Saleh, who resigned in 2012 amid mass public protests, some Western officials have alleged that Iran financially supports the Houthis in an effort to control Yemen’s Red Sea coast. Voicing support for the Saudi bombing campaign, Turkish President Tayyip Erdogan last week accused Iran of seeking regional dominance in the Middle East. Tehran officials said Erdogan’s visit to Iran, which is scheduled for next week, may now be scrapped. The warning came from Iranian MP Esmayeel Kosari in his Sunday interview with the semi-official Fars news agency. Iranian Foreign Minister Mohammad Javad Zarif called on Ankara to act responsibly in the conflict. Russia has also warned against reducing the complex Yemeni conflict to a simplified stand-off narrative, whether national or sectarian in nature. “We cannot allow it to degrade into a Sunni-Shiite confrontation. Neither can we allow the situation to turn into an open conflict between the Arabs and Iran. We will do everything to prevent it,” Russian Foreign Minister Sergey Lavrov said on Tuesday. The intensified fighting in the country provides a fertile ground for extremism and terrorism, with Yemen having already having been an operational base of Al-Qaeda militants for years. After the Yemeni and Saudi branches of Al-Qaeda merged to form Al-Qaeda in the Arabian Peninsula (AQAP), the group became one of the world’s biggest exporters of terrorism, with the US considering it the most dangerous branch of Al-Qaeda. AQAP claims to be behind January attack on Charlie Hebdo journalists in Paris, with terrorists saying the main enemy of Islam is now France rather than the United States. The latter has already scaled down its operations against AQAP in the region, undermining an effort dating back to 2002. The conflict in Yemen may also hamper the campaigns against the terrorist group Islamic State in Iraq and Syria, where US and its Arab allies found themselves on the same side as Iran. Extremist groups affiliated with the Islamic State (IS, formerly ISIS/ISIL) now operate in Yemen, with its militants claiming responsibility for recent attacks on mosques in the country's capital Sanaa, in which over 100 people have been killed and hundreds injured.